Need more Aaron Judge and Cody Bellinger RCs? If your Christmas list included Turkey and Ugly Sweater parallels, you’re getting your wish. The 2017 Topps Holiday hobby shop promotion is bringing them both along with some other fixings. 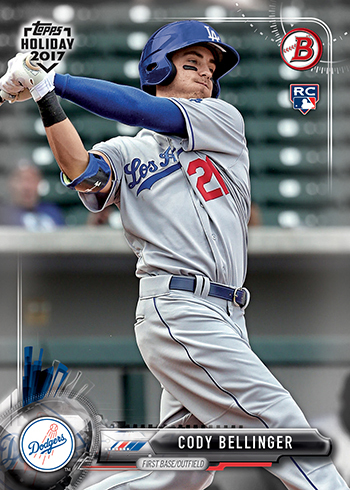 Starting November 17, collectors who visit SPORTS CARDS PLUS and spend at least $10 on Topps cards receive ONE FREE PACK (limit of 1 pack per person per day) of three exclusive 2017 Topps Bowman Holiday baseball cards. Inside are festive parallels of 2017 Bowman and 2017 Bowman Chrome Baseball cards. Topps announced that in addition to such thematic parallels as Ugly Sweater, Wintry Wonderland and Turkey. Autographs are also randomly inserted. A new card of Santa Claus is also part of the mix. He’s joined by Rudolph and a Snowman on the 2017 Topps Bowman Holiday Baseball checklist.